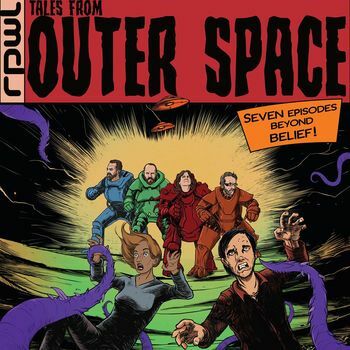 It is no secret that I am a HUGE RPWL fan and that I was really looking forward to this new, their 7th studio album, called: Tales From Outer Space. This brilliant album contains 7 brand new tracks and they are all related to science fiction and alien visitation. Opening track and also lead single is A New World, featuring a magical driving guitar riff and a more than excellent addictive chorus. Follow up Welcome To The Freak Show (great title) is lyrically very interesting and filled with almost English “black” humour dealing with politics and religion in atypical Yogi Lang - way; love it!! Then you can hear the best song of the album, the epic Light Of The World. One of the best RPWL songs ever, just listen to the utterly astonishing guitar playing of Kalle Warner and you will be hooked on this track, just like me; an ab fab song so to say!!!! Not Our Place To Be sounds like Pink Floyd and the band is assisted by no one less than Guy Pratt (Gilmour, Floyd) on bass guitar. Last but not least you can enjoy Far Away From Home, a ballad like piano song with a great vocal performance by Yogi. Conclusion: Tales From Outer Space is a marvellous album, a must for lovers of melodic (Floyd-like) progressive music and it is about time that this amazing German band got some more attention and recognition in the music business. This one to me is a true candidate for prog album of the year!! Buy or die! !